SendGrid is a popular cloud-based email delivery service. A few months ago, I had an opportunity to work with this technology along with Spring Boot application to send email to subscribers. Today I am going to develop a very simple Spring Boot REST application to integrate SendGrid email API to send an email to a valid email address. SendGrid is not free. But you can sign up for one-month free trial without having a credit card. You can send 40000 emails/month by this trial account. After signing up, you need to create a template. Additionally, you are required to create an API key. 1. From the left panel of your dashboard go to templates->Transactional. Then click "Create Template " button. 3. Template id is visible at this stage. You need this id in our application. 6. Give a template name and double click on <%body%> text. 7. Add the following text to the editor and save the template. 8. Finally, click the right arrow to exit from template editing. 2. Click ‘Create API’ button. 3. Give a name of your API Key, allow full access and finally click ‘Create and View’ button. 4. API key is created. Click on API key to copy. Paste it at any safe place to reuse later. Click “Done” button to finish. Important Note: You can see this API key only once. If you lost your key, you need to recreate again. POM File: We added an additional dependency of SendGrid. * Simple Controller class to handle HTTP request. * Pojo class to hold user request data. Most import method is PersonalizeEmail. Here we configure our email settings. 1. At very first, we need to create an instance of Mail. 2. Next, it requires creating an instance of Email. With this email instance, we set “from” information of our email. 3. We assign this ‘from’ instance to the Mail object we have created in step 1. 4. In this step, we assign subject of this Mail. 5. Our next task is to assign recipient to our Mail instance. To accomplish this, SendGrid provides a Class name ‘Personalization’. After instantiating Personalization, we assign recipient name and email id. 7. Add template id: Assign the SendGrid template id. 9. Add content to the email. Complete Code: Please don't forget to replace "Your_SendGripd_API_Key" with your real SendGrid API Key before run. Sending Email: Please have a look at the sendMail method above. 1. Need to create an instance of SendGrid. 3. Create a Request object. 5. Set method = POST of the Request instance. 6. Set endpoint = "mail/send" to send email. This endpoint allows us to delivery email over SendGrid’s v3 Web API. 7. Set body of the Request instance with the help of build method of the Mail. 8. 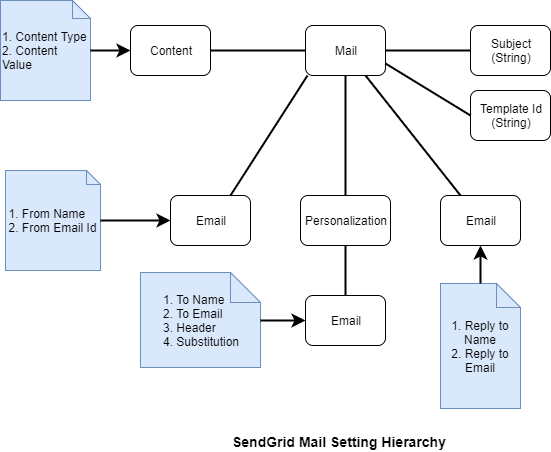 Send email calling API method, which returns Response type instance. 1. Download the full source code from my GitHub repository. 2. Assign template id and SendGrid API key. "message": "Body of this email." 5. If everything goes right, the recipient should receive this email very shortly. In my case, I had this email. 8. Go to the SendGrid dashboard, then click Activity from the left panel. Delivery reports are available there. Monir thank you very much for this post it was amazing. Real good step by step guide.